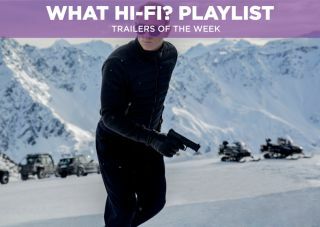 Trailers of the Week: Spectre, Aloha, Big Game, Hitman: Agent 47 and The Man from U.N.C.L.E – watch them at What Hi-Fi? | What Hi-Fi? Less a trailer in so much as it's a behind-the-scenes peek at the next Bond film, with rumours swirling around that it could be the first half of a two-parter. Hmm. With Kingsman: The Secret Service, Mission: Impossible 5 and Spectre, 2015 seems to be the year of the spy and, from this trailer, Armie Hammer and Henry Cavill look like they're having great fun in this throwback to the 60s TV show. It's been a long time since we had something of genuine quality from Cameron Crowe but, despite looking a bit smaltzy, Aloha could be a return to form. When Air Force One is shot down over Finland, a young boy called Oskari (Onni Tommila) comes to the aid of the President (Samuel L. Jackson) and protects him from some terrorists. This has guilty pleasure written all over it. After the okay Hitman a few years ago, the bald assassin is back with Rupert Friend displaying his particular set of skills. Second time the charm?